This is the time of year where roads are icy and weather becomes unpredictable. It’s important for your team to become prepared for poor driving conditions for better winter driving and to avoid injury to your staff and work vehicles. By regularly checking a few key elements of your work truck or van, you can easily avoid common mishaps that take place in the winter months. We’ve outlined 5 key vehicle safety items to review this season, below. We understand that just because the weather gets messy, doesn’t mean your work to-do list gets any shorter. Unfortunately, during the winter months it is imperative you driver slower and use more caution on the roads. It’s also important to remember that it takes longer to slow down on icy, snowy streets, causing more strain on your brakes as you use them more frequently. For better winter driving, we recommend checking your brake pads every 20,000- 25,000 miles to ensure they’re not worn down or showing any signs of decay. 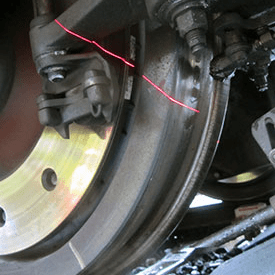 Don’t neglect your brakes this time of year, your work vehicle depends on them! There is nothing more dangerous than wipers that suddenly quit in the middle of messy conditions. 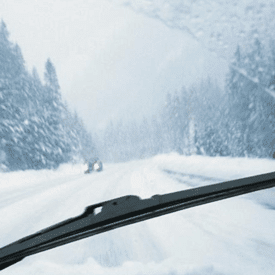 Avoid a catastrophe by checking the conditions of your wipers on a biweekly or monthly basis during the winter months. Waiting until it’s too late to replace your windshield wipers is a common mistake that drivers make. If you’re relying on your work vehicle to get you to and from a job site, it’s imperative to replace wipers frequently. “Even the slightest blizzard or rainfall can decrease road visibility if you’re using worn-out windshield wipers, and when you’re driving down the highway in snowy weather you shouldn’t be wondering how effective your wiper blades are” (Auto Anything, 2017). When navigating back roads or unfamiliar areas for work, it’s imperative you can get there and back to the office again safely. 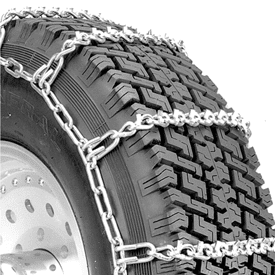 Investing in a set of tire chains might be necessary, depending on your line of work. Tire chains provide better traction to the road, and are designed to better protect you in really poor weather conditions. The last thing you want to be doing as you’re on your way to a work event or client meeting, is jump starting your car battery. Don’t make the mistake of waiting until it’s too late to replace your battery. 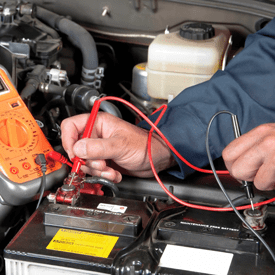 Keep an eye on how your battery is performing by bringing it to a mechanic and having them evaluate the condition. In the meantime, ensure you’re never in a dangerous situation by investing in vehicle jumper cables or a portable jump starter. “Make sure you load-test your battery before you embark on a trip (during winter time), especially if you’re driving an older model…” (Auto Anything, 2017). It’s important to remain diligent about your vehicle’s maintenance during winter time for better winter driving. You can easily avoid accidents and other dangerous situations by regularly checking the conditions of your windshield wipers, brake pads, car battery and by investing in tire chains if necessary. Explore additional information on tire options, when to remove your snow tires and tips for safely towing in the wintertime, on our blog. 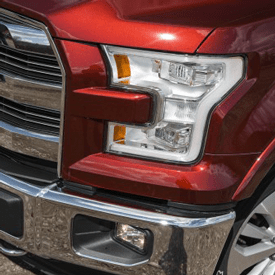 ← How Does a Truck Lift Kit Work?